New sleep research from Parks Associates reveals nearly 29 million US broadband households currently own a product that helps them track their sleep quality, representing less than half of the nearly 60 million consumers who report having at least one sleep problem. 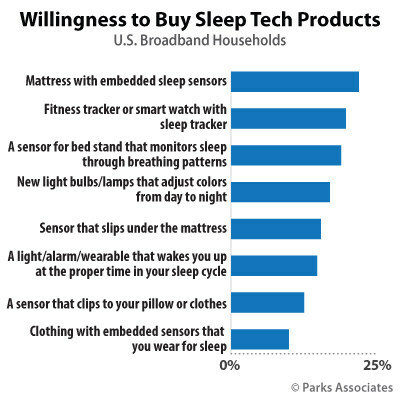 Sleep & IoT: Behaviors, Awareness, and Opportunities reveals 51% of US broadband households are interested in buying a sleep tech device. Parks Associates will share consumer data on IoT sleep technologies and other connected health solutions at Connected Health Summit: Engaging Consumers, August 28-30 at the Manchester Grand Hyatt in San Diego.